Blues Guitar Lessons, Chromatic Blues 2 - Free Blues Guitar Lessons! This free blues guitar lesson is on the chromatic blues. It goes with this chord sequence G13, G7#5 and finally C9. 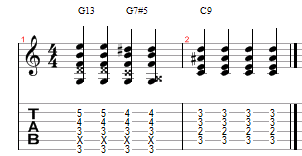 Switch it up when playing this chromatic blues lesson. Start by moving the 1st pattern up or down x # of frets. Do this the each chord and don't forget strumming. Check out all Blues Guitar Lessons.